Q1 Can you tell me briefly on the history of the Library’s establishment in this university? 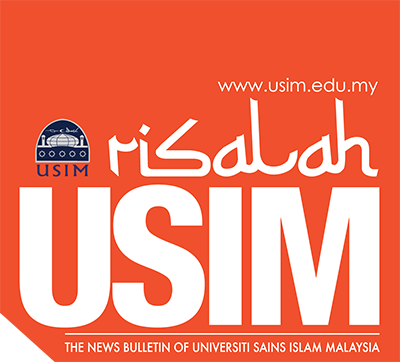 USIM Library was established in July 2000 at the Baitulmal Professional Institute Building (IPB), Kg Pandan, Kuala Lumpur. Then, in July 2001, the library moved to the 14th Floor, Menara A, Pandan Indah where KUIM began its operation at the new temporary campus as the former location was unable to accommodate increasing number of students. In July 2005, the library moved to its permanent campus in Bandar Baru Nilai. Nevertheless, the Pandan Indah Library is still in operation for the use of the Faculty of Medicine and Health Sciences (FPSK)students as well as the Faculty of Dentistry (FPg) students. In the early stages,when I reported for duty in October 2000 the library had only three Library Assistants. Up to 2017, the number of library staff is 45 staff in various grades. The USIM Library works to provide a variety of reference materials for students as well as for the university staff. Q2 How does the USIM Library embed knowledge culture amongst the university? The library plays an important role in the life of students at the university as the library becomes the place for reference. However, this situation is changing as it evolves from library use to information technology that allows students to access information wherever they are. However it does not imply the library’s role in helping the university to uphold the philosophy of Naqli and Aqli values. This is because, USIM library provides a variety of platforms for all varsity students to obtain information. For that reason, USIM library takes a proactive approach to create a knowledge culture at the university by organizing various programs and methods for the benefits of all campus citizens. The library believes that knowledge is important to build the image of the university, hence that is why the efforts to empower the library as a building of knowledge are continuously enhanced. Among the efforts is the establishment of the Kelab Sahabat Kembara Ilmu (SKIL) that helps to bridge the library with the students. SKIL is a club with university students as members and these students are given training and guidance related to library management. The group also helps the USIM library in organizing various programs such as World Book Day Celebrations, Resource Center Management Seminar for school students and so on. All of these have an impact in formulating the appreciation of the Naqli and Aqli values for the university community and also outside the USIM. In the same time, the library provides facilities for the university to access various information from external parties. As of 2016, the USIM library has a total of 11,029 Serials / Serials collections; Special Collection 4,026 manuscripts; Open Shelf Collection of 92,246 copies; 3,104 Multimedia materials; 6 manuscripts; and various electronic resources such as Digital Library, e-book and e Journal. In addition, the USIM Library provides a variety of other facilities such as viewing room, seminar room and so on. Q3 How ready is USIM Library in facing digital challenges with all information is virtually accessible without reference to the library? In my opinion, the development of information technology nowadays has led to the increasingly favored needs for digital information by consumers, compared to traditional methods of patroning the library. This is because the convenience of digital services in cyberspace not only saves a lot of time but users can also access information anywhere and anytime as well. However, the users, especially students, have high tendency to prefer social media such as Facebook, Instagram, Twitter and so on. From an academic perspective, the attitude of too dependant on these social site is an unhealthy culture. We can use that information as a guide but at the same time it should be referred to a more authoritative source. The information obtained through the reading of books and articles is more accurate because they have the source of the original author. Hence, it is very important for users to think and refine all information obtained from these social media sites. Therefore, in order to enable the USIM library to remain relevant in this digital era, USIM library also provides a high level of provision for Library Management System facilities namely the Integrated Library System (Virtua); Digital Document Management System (e-Imtiyaz); EzProxy; Library Material Safety Systems (Circulation Module, Tagging Station, Security Gate and Pedestrian Barrier); Internet Zone Management System; Library Entrance System; Vending Management System; SelfCheck Machine and BookDrop Machine. Q4 What challenges do you face throughout managing the USIM Library? The most challenging issue I managed in the USIM Library was on how to develop human resources in this library. This is because, managing humans requires a variety of strategies and skills as each individual has multiple characters. Hence, I tried to change the negative thinking to positive among the staff. I am also concerned about the concept of togetherness in the organization to ensure that all library staff are motivated to work together for the advancement of the organization. Alhamdulillah, thanks to this collaboration, the Library has won several awards such as the USIM Vice-Chancellor Quality Award and the Creative Innovative Group Award (KIK). In addition, issues related to the provision are also a challenge that the library needs to face. In its early stages, reference books could be purchased following reference materials used by the lecturers. But the situation is changing as there are various softwares that need to be purchased or subscribed by the library for user reference. This all adds to the cost but is very necessary because if we do not have this facility it will impact the users and affect the reputation of USIM library. However, in order to help overcome some of these financial issues, there is also reference facility made between the libraries with other local universities. This method helps greatly to enable all parties to get maximum benefits. Q5 What are the your expectations and hopes to the university staff in ensuring that the library is optimally utilized? I sincerely hope that USIM members will have the Naqli and Aqli DNA to ensure that this is true in every USIM citizen. This DNA is important to me as it will be the foundation of characters formation of USIM’s citizens in order to appreciate USIM’s philosophy, mission, vision and objectives. Understanding and the appreciation of the knowledge culture can also make us into critical and innovative thinking people. I urge our university students to appreciate knowledge by always being close to the library because a knowledgeable society is a successful society.